We are enlisted amongst the leading names in the industry offering our clients wide range of Cucumber Powder . Our company takes great pride in manufacturing, exporting, and supplying optimum quality Cucumber Powder. The Cucumber Powder provided by us is powdered into fine particles. 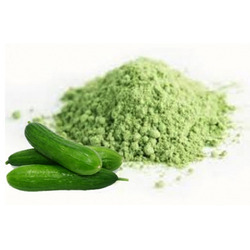 The premium quality Cucumber Powder which we are offering to the valued clients is extensively used in various face packs to make the skin glow. - GCT Cucumber Powder contain anti-inflammatory flavonol called fisetin - plays vital role in brain health. - Placing cucumber Powder on the roof of mouth to get rid of odor-causing bacteria. - Release excess heat in your stomach - primary cause of bad breath. We are leading manufacturer & exporter of Fruit Powders, Vegetable Powders & herbal Powders. It is spray dried Cucumber fruit powder used in cosmetics or food industries. · We are offering premium quality of Dehydrated Cucumber Powder, which is hygienically manufactured at Advanced Room Temperature Dehydration Technology. With sincere intentions to preserve and uplift our reputation in the market, we bring forth a distinguished assortment of Cucumber Powder . Madvik Research Labs Private. Ltd.
Enriched with immense industrial knowledge, we are engaged in offering Natural Cucumber Powder that is highly demanded by the clients . 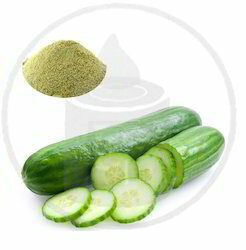 We offer Cucumber Powder which is used widely in face pack to glow the skin. Pack Size: 100g And Also Available In 150g, 250g, 500g And 1kg. With sincerity and hard work of our professionals, we have carved a niche for ourselves in this domain by providing a premium quality gamut of Spray Dried Cucumber Powder. With thorough expertise and understanding of this industry, we are enormously involved in offering a quality assured range of Cucumber Powder .